Remember this guy? Kei Igawa was supposed to be one of the first guys up this year from Triple-A for a spot start. Now, it’s already September and he still hasn’t reached the majors this year — not even after the rosters expanded. Igawa can blame his 4.29 ERA and 1.42 WHIP for not being promoted. Both averages are regressions from his 2007 campaign in Scranton. 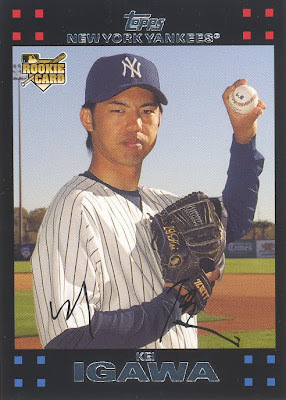 This is a 2007 Topps Rookie Card of Igawa. Unfortunately, it will remain worthless until Igawa wins more than two games in the majors.